The White Rock Cornish X meat birds are now…meat! Today was to-the-processing-house day. Up at 5:15 a.m. to get them rounded up for the trip. And it seemed to be a pleasant one for them. They arrived looking laid-back and content after a breezy 35-minute drive. This was gonna end up their “one bad day,” but so far, so chill. To save an hour plus round-trip drive to pick up cages from the processor, we decided to load ’em directly in the trailer. The original idea was to cover it with a tarp, but I waited till the last minute (this morning at dawn) to fit it, and there was no easy way to get the tarp secure. So, a last-minute solution that turned out great: snow fencing and wire. Three sections were cut from a roll, overlapped, and fastened with twists of light-gauge electric fence wire. Really quick, secure, easy. Perfect! At the processor, I helped hand off the birds right through the slaughterhouse door. And that was it: back at 5:30 p.m. for the pick-up. The trip was smooth, but the end was still a little impersonal: in one processor house door, out the other. I hope to fill in that last killing step soon. So there we are, 39 free-ranged chickens, after what seemed to be a happy, active, fast-growing, 11-week life, are now government-inspected, weighed (average about 7lbs/3kg), packed in plastic, and pre-chilled for the freezer. This seems pretty close to sane meat production. Chicken dinner! Wow! They’re only 11 weeks old? I had no idea chickens grew that fast. I’ve really been wanting to raise some free-range chickens on my farm, but there isn’t a processor close and I don’t think I could handle that step myself. Have fun eating some yummy dinners! in my family, we took a “if you can’t handle that step you don’t get to eat meat” approach–a bit extreme, but it gave me a good appreciation for the quality of both life and food. also? that thing about not naming the birds you’re going to eat? absolutely right. Lisa: it is a special breed, the White Rock Cornish, that grow so fast. All other breeds would take a couple weeks longer to get to an interesting weight. They look great! Will you sell the birds or keep them for yourself, Mike? At our farmers market, the farmers that supply us with our chickens … we spoke with them last fall, and they allowed us to come and help process the birds one evening. I didn’t actually kill any of them, but I was right there to watch them bleed out. It was very satisfying to really know where our food was coming from. I grew up (and live in) a town that was one of the largest poultry producers in Connecticut, till the industry finally died in the late 80s. Indeed I’m here because in the 1930s my grandfather had a chicken coop and house built that they moved too from NYC, altough they later switched to being vegetable farmers. The farmers I knew by then were amazed how fast the birds grew compared to 10, 20, 30 years earlier. A couple years ago the gentleman who had owned the largest farm in town (four 50′ x 600′ coops) commented what eggs were now selling for in the supermarket, twenty years earlier he would’ve spent that much just to buy grain it took to lay a dozen eggs. Since the late 80s the only large scale poultry left in town is R&D focused, developing larger, faster growing birds. The company that’s now located here (Pureline) specializes in breeding chickens that do not need anti-biotics. They were founded by Henry Saglio when he was 89 — Mr. Saglio had many decades earlier founded Arbor Acres which was a major breeder that helped develop many of today’s modern poultry lines, including de-emphasizing natural immunity because science at the time said you could compensate with anti-biotics. Excellent post! In about 10-11 weeks, we’ll be doing the same with Rock Cornish. We did a group order of 222. 40 of them our OURS! Yay! I already anticipate the next time we do this! 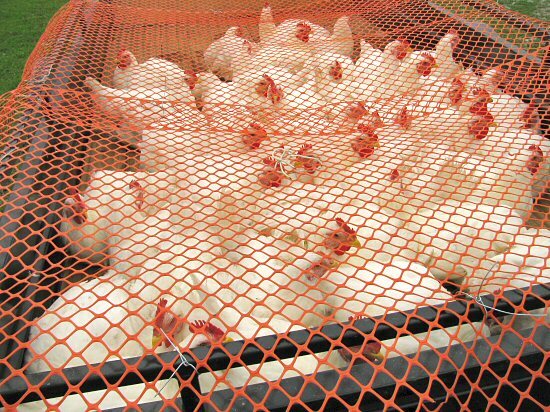 chickens raised indoors are ready in 5-6 weeks, how is that for quick. We had 25 day old chicks off a friend who has 2 sheds 0f about 40,000 chickens. We raised them outdoors and all that wanted to do was eat and eat and eat!!!! we processed most of them betweent 10-12 weeks at home. they were very good but no were as good as some of the heritage breeds we have tried. We kept a couple longer and had 14lb chickens. more like turkeys. How ever you have to be careful as they can get to big and have trouble walking. My hubby and I want to give raising meat chickens a try. Our problem is that we don’t want to process them ourselves. I don’t have the stomach or heart for it, although I would have no problem eating them if someone else did the processing. I am not certain that our local guy will process chickens, even in bulk. Something to explore. I notice that you had to do some traveling to get to the processor; there may be someone in the larger city an hour south of us who would offer this service. Thanks for sharing your experience. What did it cost to feed the chickens this time? were you able to find an organic abbatroir to do them? “I don’t have the stomach or heart for it, although I would have no problem eating them if someone else did the processing” Farming for ourselves forces us to confront the realities of food production, if they make you squirm than maybe you should re-think your diet. Mike – if you butchered the chickens on the farm, you could collect the “leftovers” to be used as organic fertilizer (homemade bloodmeal). After making chicken stock, leftovers could become homemade bonemeal. Just a thought, I’m not actually sure if it’s worth the effort. Did you notice the context-generated text ads right above the comments? Interesting what our modern word associations have become! Eric: Yes, going through the whole process is very quietly satisfying. Since this post, I helped process 9 birds on another farm, from killing to carrying to the cooler for pre-freeze cooldown. It really made sense. More in another backpost, coming up. Michaela: Group ordering sounds great. I’ve been thinking a lot about small group things lately. Of course, CSA is like that, but there are lots of other projects that are more doable and fun with a group as well. Patti: Going to a processor is convenient in some ways, but expensive. DIY may at first sound like a stretch, but it’s actually very straightforward and practical. You’d probably be surprised. Sometimes in farm families, some do the actual killing, others don’t like to but help with cleaning and everything else. It’s all so closely related, though, that when you’ve helped with any part of the process, you could do it all if you had to. Kari: Haven’t figured out the feed cost yet. It’s definitely at least a bit less than with the first round last year, because they were out foraging so much. The average weight is around 7 lbs, a pound less than last year, but we didn’t have the deaths (lumbering, indoor White Rocks tend to sponteneously keel over, I’ll explain more in another post), so overall, we got way more meat for less feed, compared to letting them eat feed more-or-less continuously. Cathy: We paid $3 per bird, and 75¢ for halving, plus $8 for saving the feet, and a few more bucks for saving the organs. It adds up! We used a regular processor, not exclusively organic. I think we’ll make a big effort to DIY next time, maybe in batches of 20 at a time. Chris: That’s something to look into! There’s definitely always a way to use all parts. It felt good getting back the feet this time, a special request from one of our CSA shareholders. They were in great shape. I kept some, will use for soup stock and may try preparing a few for eating. Are you guys going to be processing your own in the future or always feed, watch grow, drive, drop-off, pick-up… ? If no then why not? We’ve been raising, killing, and processing our chickens for the past few years… until this year. Because of a move, we’re not doing it this year. I really miss it. In our family, my husband hunts deer and other game and I had been raising the chickens. We’ve been able to provide entirely for our own meat needs/ desires. What I’m realizing right now is how connected to the natural world raising my chickens made me. “Harvest” day was always a holiday. There was the preparation the day before and the morning of. There was the hard work of killing, plucking, cleaning, and freezing. And we always celebrated with a chicken and garden vegetable dinner in the evening. I was a “vegetarian” when I killed my first chicken while working on a small organic farm. I encourage people to take this project on, not because I think it would save the planet, but I think it would bring them a deep sense of connection and joy. Wow, Cornish X, free range? Everyone I know that has had them has had trouble getting them to move three feet from the feed trough. These look (looked?) nice, though. We have only egg birds; when one reaches that age of “seniority,” she goes into the crockpot overnight. We’ve always done all our own animal work; but of course we’re homesteaders, not farm-scale in the usual sense. But how tiny does a farm get before it’s not a farm? We do sell eggs… The nurse said: “Where do you work?” as she inserted the IV. “Library.” “Those are outside hands.” “Yes, well, I also farm an acre.” And I was proud to say it. Here’s to the Tiny Farm Blog! I also just took our second batch of 32 assorted heritage breed free range roosters to our poultry processor this morning (I was up at 5 a.m. too!) We took 40 of them two weeks ago at age 14 weeks and they only averaged 3.5 lbs. –we knew these breeds would grow more slowly than Cornish Rock but had no idea it was such a tremendous difference! I expect this batch to be 4-5 lb. each. We have fed them organic feed in addition to their ranging – and since we started them so early in the season – before there were many bugs to catch – we spent so much on feed we will be lucky to come out even. We slaughtered the first dozen birds ourselves, but it takes us way too long (even though we have a chicken plucker!) Plus, I think the fact that they are processed in a USDA inspected plant, certified weight, professionally packaged and labelled will reflect well on us, being new farmers. We have another hundred chickens that will be ready in a few weeks. We are pretty proud of our first chicken-raising efforts. No catastrophes–other than losing a few a week to a great horned owl who lives in our woods and takes advantage of the easy pickin’s. He is very wasteful-only consumes the heads. Anyone have ideas for owl deterrence? Your farm looks wonderful. Enjoyed going through the pictures on your blog. They are perfect. Interesting post and comments. I’ve always considered doing this, but figured the work involved with processing seemed pretty daunting. I don’t mind sitting around pulling weeds all day, but pulling feathers sounds less fun. Do all locker plants process chickens or is this a special service for some? Also, I wonder if a heritage breed could command higher prices at the farmers market? But the comment on the weight gain is very interesting.